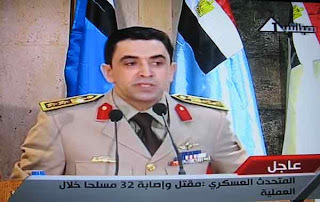 Today the Egyptian armed forces held a presser to discuss the latest development regarding its historical military campaign in Sinai where we were introduced for the first time to the first Egyptian army spokesperson Colonel Ahmed Mohamed Mohamed Ali. Sadly enough the only new thing we know from that we got a new official army spokesperson who is cute and admired by girls online !! It is a blank statement about Sinai and what is happening there. Any journalist who went there in the past weeks ago knows what I am speaking about. He did not tell us WHO killed our soldiers last month in cold blood. He did not tell us WHY our soldiers were killed last month in cold blood. All what we know aside that the army got a spokesperson now that the army changed the name of that historical mirage operation from the name “Eagle” to “Sinai”and that stage two of that operation Sinai will start at Egypt’s mount Doom “LOTR fans will relate” aka mount Halal to get those unknown militants ! !Ah and we know that the army does not confront the though with weapon but rather with though and that’s why they sent bunch of Egypt’s Ultra conservative Salafist sheikhs like Abdel Rahim El Shahat to Sinai to speak with the Salafist Jihadists there !! Having a spokesperson does not mean there is a real change when it comes to the relation between the army and the media or the public. There is no change as long as there is no transparency and “that talk is off the record”. May God bless the souls of our soldiers ,they do not deserve this. Arrange a huge Wahabi Salafist rally in Sinai. Get all the bedouin and others out. Once the Wahabi jihadists and salafists are in Sinai close the bridge and tunnel and then send in Madonna and Britney Spears to do a concert and in the morning you will find the jihadist all dead from heart attacks then bury them in the sand and pay Madonna and Britney for a job well done.